It's the end of an era for Upper Deck's flagship gridiron set. 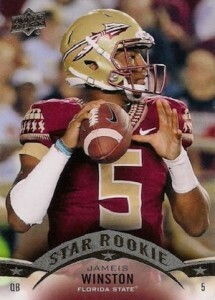 2015 Upper Deck Football marks the set's final release under the card maker's CLC-exclusive for NCAA cards. 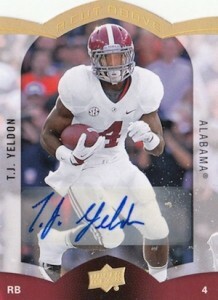 Like recent years for the product, the product focuses on a challenging base set that's heavy on 2015 rookies, autographs and other nods to earlier sets. The 2015 Upper Deck Football base set has just 45 cards. On top of those are 170 rookie players hoping to make their mark in the NFL, which combine to fall two or three per pack. Of the Star Rookies, 40 are considered SP while another 30 are classified as being rare. 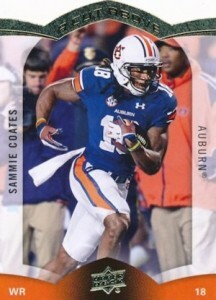 Twenty players have hobby-exclusive photo variations that land at a rate of two per case. 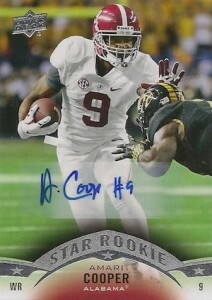 Star Rookies also have Black and White parallels. Numbered to 10, these are a case hit. The three autographs per box come in several forms with a heavy emphasis on rookies. Star Rookie Autographs are essentially parallels of the base versions. 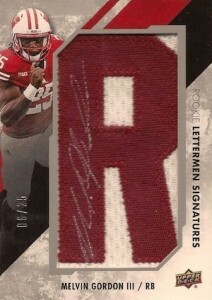 Rookie Lettermen are all numbered to 75 or less. 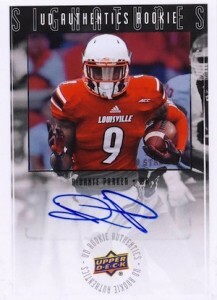 A Cut Above Autographs (1:228), UD Authentics Rookie Signatures (1:480) and College Football Heroes Autographs (1:5,680) are offshoots of basic inserts from the product. 2015 Upper Deck Football has several other inserts, names of which should be familiar for those who have collected the set in recent years. UD Authentics Rookies are inserted two per box and are numbered to 500. A Cut Above, an insert that dates back to mid-1990s Upper Deck products, can be found with both Rookie (1:7) and Legends (1:17) versions. As the name alludes to, the cards have a die-cut design. College Football Heroes (1:16) return. 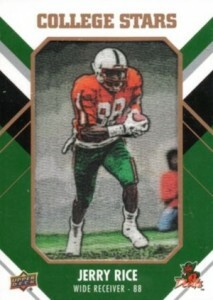 The ten-card set looks at players from the 1990s through to the 2000s. 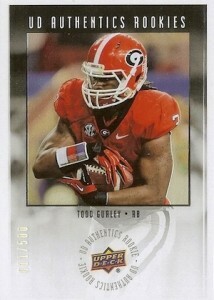 Back for a second year are the College Tribute Patch cards. An extension of the Mascot Patch cards from several years ago, these spotlight many of the traditions surrounding college football around the country. Exclusive to hobby packs, they combine to fall four per 12-box case. 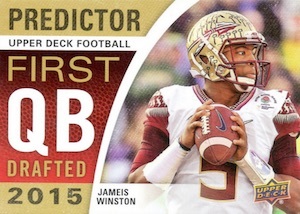 Interactive Predictor cards also return for 2015 Upper Deck Football. They're available for quarterbacks, running backs and wide receivers and give collectors a chance to win exclusive sets. 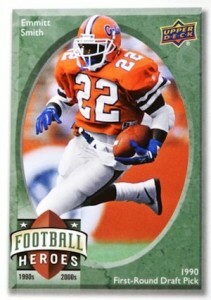 In 2014 Upper Deck Football, Predictor cards were based on the first player picked for each position at the NFL Draft. 10 cards. 2 per fat pack. 47 cards. The first print run is per letter and the full amount per player is also noted. 58 cards. 1 per Blaster. 65 cards. Serial numbered #/500. Ryan – I didnt know this about UD losing the NCAA license – what company will have it next ? Patrick � Panini now has all the announced college licenses except Notre Dame (one that UD holds an exclusive with still). Jmatt33 � It should be before, but we never know for sure until it arrives. Not much love from UD with LSU cards. No Tiger stadium and only a few cards from the La’el and Jalen Collins both projected first round picks. The Sweet Spots in the blasters was very surprising and I love they have variations of the helmets as well. Very surprising for the blaster level even though they may just be clearing out all their stock before they lose the license. Either way a winner for all of us. 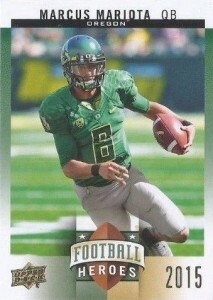 Got a case-hit B&W Mariota 6/10 from buying 3 hobby packs! Awesome! Overall a nice set with great photography and design. Retail boxes are big fun as well, with the Sweet Spot cards a nice touch that will be a saved search on ebay for me for months to come! Bought three blasters by mistake (mixed in with contenders draft), but I always liked UD football. Never thought it carried the value as other products but I thought the base set is by far better than other products that just have a zoomed in cutout picture of the player surrounded by some kind of chrome or sparkly design. Nice clean action shots and I’m probably close to completely the set. Just wish the inserts were better, they’re kind of boring looking. And don’t care for the sweet spot, would wish it was a better chance of an auto than getting a sweet spot. Seems like a cheaper version of “event worn” patches. A really nice looking set! The photos are crisp and clear. You just have to handle the cards very carefully because they’re not too durable. Definitely not an easy set to complete. Just started collecting again last year after a 25 year break from it and just wondering with this set, how to find out how many of the ACA rookie autos were made of each player? 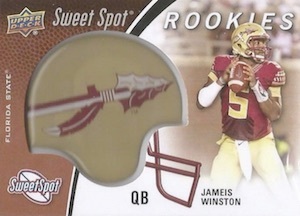 I just pulled a ACA Jameis Winston auto this morning and was just really curious. I FINALLY got the #6 card this morning!!! A really nice set once you get it all together, but expensive. It took a while to get it in my thick skull that you really can’t get cards 1-45 very easily from what I think you guys call “Blaster Boxes,” would I be correct in that? Now, I’m done buying packs looking for the cards #146 and above to get the full complete set, though I do have some, because I’m not a millionaire.